Prepare for a wildly mis-proportioned review. Not the figure: the review itself. That's a very accurate bio for Batman, and unlike some releases we could name, it's not recycled text. Yay! This figure is officially "Golden Age Batman," though the actual costume differences between Batman's Golden Age and Silver Age costume are so negligible, he could easily stand in for either. For instance: in the Silver Age, Batman wore a gray suit, blue boots and gloves, a yellow capsule belt and a blue cape; in the Golden Age, Batman wore a gray suit, blue boots and gloves, a yellow capsule belt and a blue cape. That's not to say there aren't differences - GA Bats' trunks are black, rather than blue, and the bat symbol on his chest is large, blocky, and has no yellow circle around it. There's a bit of blue on each hip, meant to represent the highlight artists would draw there, but it ends up looking more like a stripe than a highlight. 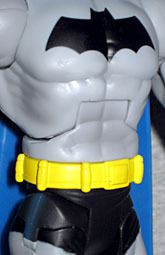 To be fully accurate, his belt should be wider: the edges of the belt should come up higher and lower than the capsules do; this figure shares its mold with Crime Stopper Batman, which was Silver Age influenced. The one part of this mold that isn't shared with the DCUC1 release is the head. We often think of Golden Age Batman as being rather tough and serious, while Silver Age Batman is the Adam West-style goof, but that's not entirely the case. This face, with its short ears, forehead shadow and highlighted blue eyebrows is totally Golden Age. He even has a little smile! Now that we've blazed through the review of the figure, we can start talking accessories, and that's why this review is misproportioned: normally we'd talk a lot more about the toy, and just use one paragraph for the extras, right? And if all we were talking about was the base (gold rather than Catman's silver) and the included poster (the cover of Detective Comics #164), then that's what we would have done. But this figure is a Kmart exclusive, so we have something else worth talking about. Yes, something besides the fact that Kmart has an exclusive. In an effort to regain some of the market they've lost over the past decade or so, Kmart has struck some kind of deal with Mattel. They get special waves of figures, have some releases early, and host special collector events. In this case, they not only got to put Batman Legacy Series 2 on shelves when Big Three have barely gotten Series 1, they also get an exclusive Bat-Mite packed in with Golden Age Batman. 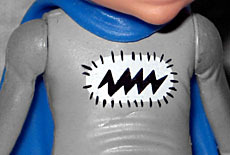 Bat-Mite was introduced in Detective Comics #267 (which, yes, places him firmly in the Silver Age, not Golden). He's a fifth-dimensional imp with near infinite magical abilities, so he doesn't really fit with the modern incarnation of Batman (not that that actually stops writers from trying). 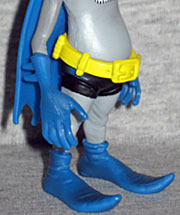 Bat-Mite is a little figure, standing just over 3" tall at the tip of his ear. He gets a unique, mold, naturally - since the only ones he could have possibly shared his sculpt with were Gleek, B'Dg or Dex-Starr, and none of them would have worked without extensive retooling, so why not start from scratch? He's got big flat feet with curly toes, scrawny limbs, and a stomach paunch. He has a tiny utility belt, and all his clothes are sculpted to look baggy and ill-fitting. The figure's head looks a little weird. The traditional Bat-Mite look wasn't a normal head - it was longer and kind of football shaped. Think "Stewie Griffin in a Batman mask." This head looks more like Matty wearing a Batman mask, and we all know what Matty looks like. He has big cheeks and a narrow crown, and his triangular eyes are smaller than usual. Even with a big grin and those buck teeth, he still looks sinister. Articulation is nothing special. He has swivel joints at the hips and shoulders, and a balljointed head. No, it's not much, but there's not a lot of room for improvement, either. What could they do, tiny balljointed shoulders? A waist? Pointless swivels in the boots or gloves? His paint is nice, with crisp edges, no slop around the belt, face or eyes, and his homemade, hand-stitched symbol looks great. Let's be clear, no one is buying this set for Golden Age Batman. Sure, he's fine, and the new head is fun, but betweeen Classic Detective Batman and Silver Age Batman, he's not really different enough to bother adding to your collection. Of course, if all you've bought up to this point are black and gray Batmen, then hey, here's something new for you! 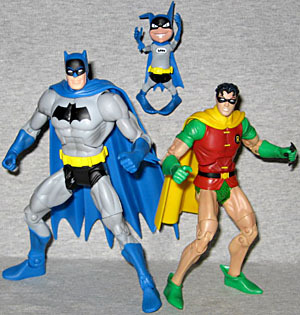 But still, it's Bat-Mite who's selling this set. The only figures he's had before were from DC Direct, and when Batman Legacy Series 2 shows up at other retailers in a few months, he won't be included. Nobody wants to pay an equal amount of money to get less product, so this exclusive is in high demand. 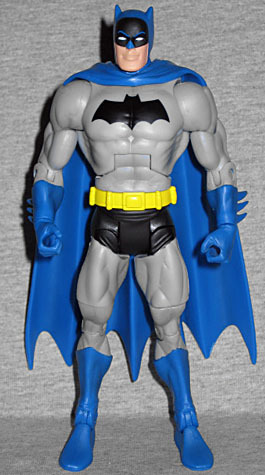 Bat-Mite not be the classic design (nor have any business being packaged with a Golden Age anything), but he's a fine addition to the Mattel DC lineup.